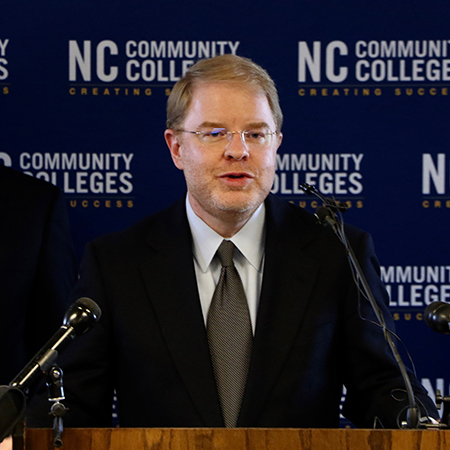 RALEIGH – The State Board of Community Colleges today (May 1) elected Peter Hans, a leader with 20 years of experience in higher education policy and governance, as the ninth president of the North Carolina Community College System. Since 2016, Hans has been advising University of North Carolina System President Margaret Spellings on issues such as technology, health care, strategic planning and K-12 education. Hans’ experience with higher education also includes 18 years of service on North Carolina’s two governing boards for higher education. The N.C. House of Representatives elected him to a six-year term on the State Board of Community Colleges in 1997. He served as vice chair of the board and chair of the Policy Committee. The N.C. Senate elected Hans to the UNC Board of Governors in 2003, 2007 and 2011, and he led that board as chair from 2012-2014. He was honored by UNC-Wilmington in 2014 for his role in improving collaboration between the community college and university systems. Hans’ career also includes serving as senior policy adviser to U.S. Sen. Lauch Faircloth (1995-1999) and then-U.S. Rep. Richard Burr (1999-2001). He also advised Elizabeth Dole during her successful run for U.S. Senate in 2001-2002. Later, Hans and former Lt. Gov. Dennis Wicker built a government relations practice at a series of regional law firms, most recently Nelson Mullins Riley & Scarborough. The team has counseled private-sector companies on public affairs, including clients in the health care, technology, retail and manufacturing sectors. Hans grew up in Southport and Hendersonville. He earned a Bachelor of Arts degree in political science from UNC-Chapel Hill and a Master of Liberal Arts in Extension Studies from Harvard University. Hans currently serves as a trustee of Rex Hospital and as a member of the International Advisory Board of public relations firm APCO Worldwide. He is a former board member for Urban Ministries of Wake County, where he co-chaired a $5.5 million capital campaign. Hans’ election occurred following a six-month search. A 12-person Transition Committee – composed of State Board members, community college presidents and a former board chair – reviewed more than 30 candidates. Six candidates were interviewed by the committee, and the names of three finalists were submitted to the full board for further review. Hans, a Raleigh resident, will begin work today at an annual salary of $275,000. The NC Community College System was founded in 1963. With 58 colleges across North Carolina and about 700,000 students, it is the third-largest system of higher education in the United States.